My son and I were recently lucky enough to spend a week in Florida visiting with family at Disney World theme parks (thanks, Mom!). My son's favorite park hands down was Animal Kingdom. This is the kid who knew the names of 100 different animals before the age of 2 and would go to the zoo every day if I would take him - so it was no surprise that this huge amusement park which is a hybrid of a zoo, animal conservatory, and Disney World theme park would be his favorite. 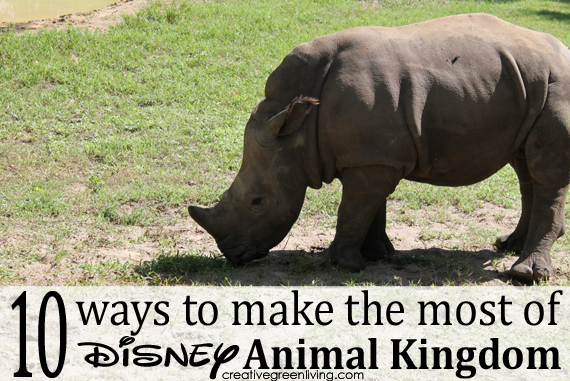 We got to visit Animal Kingdom for 2 days while we were in Florida and have some insider tips for you to make the most of your trip (and save money, too) when you decide to go visit! Whether you're an explorer or an animal, dress up! Wear a safari hat or paint cat whiskers on your face with eyeliner (or do both!). Dressing up makes the park experience more fun. Forgot your hat or face paint? They sell safari hats and have face painting stations throughout the park. I'll admit that I'm not normally inclined toward seeing shows when I'm at a Disney park (because I want to ride all the rides as many times as possible!) but the two shows we saw: Finding Nemo the Musical and The Festival of the Lion King were AMAZING. I'm talking top tier, Broadway quality productions. Plus it's a great way to spend 40-60 minutes inside in a dry, air conditioned building if the weather isn't ideal. Disney has a great "fast pass" system at all of their parks where you can essentially make reservations to ride popular rides so you don't have to stand in the long lines. Plug your ticket into a machine and it will tell you what time to come back to stand in the much speedier Fast Pass line. BUT Fast Passes run out so don't just meander your way up to the ride you want a fast pass for - go there first. We usually designate a (fast) member of our party to take all the tickets and acquire fast passes for either the African Safari or the Kali River Rapids ride while everyone else makes their way to a different attraction where we will all reunite. This way we know we'll get to ride the most popular rides and won't have to wait in line for an hour or more. UPDATE: Since the writing of this piece, Disney World has implemented a cool new system called FastPass+ that let's you reserve FastPasses online before you even get to the parks! Read more about it here. Animal Kingdom has a Wilderness Explorer program based on Russell from Up. The program is free and participants get a guide book and map showing you where you can earn badges in different places around the park for performing tasks ranging from identifying animals to playing bongo drums. We visited during the summer where the weather was hot (90 degrees and up) and sunny most of the day but then there was a thunderstorm or two in the afternoon. I saw a LOT of tourists who got wet from the rain and THEN donned their poncho. As a native of the rainy lands (read: The Pacific Northwest), I've got to tell you - this is not a good plan for staying comfortable. The truth is that once you're wet: you're wet. The poncho will just make you feel humid and gross and keep the rain on your clothes trapped. If you get caught in a rain storm, find a covered area to wait it out. If wet clothes bother you, bring a change of clothes wrapped in a plastic bag to change into once the rain stops. I chose clothes that dried fast (like my quick dry pants from Duluth) so once the sun came out, I felt better pretty quickly. In addition to helping with rain without leaving you feeling damp and squishy, your umbrella doubles as a personal shade creator (AKA parasol) if it's super sunny. You are allowed to bring outside food and drinks into the park. You are NOT, however, allowed to bring disposable plastic straws or lids so if you stop at Starbucks on your way in, make sure you finish your drink or be prepared to be asked to throw the lids and straws away at the gate (they'll provide paper straws in the park you can use). Better yet, bring your own reusable stainless steel bottle (This is my favorite one ) to avoid this. You can bring a cooler if you'd like or pack stable items like PB&J, pretzels and apples. You can order cups of ice water for free at any of the food establishments in the park that serve fountain drinks. We frequently ordered 1 cup of ice water and 1 cup of just ice. We drank the water and used the ice to either top off our water bottles OR just set it in the cup holder of the stroller to melt into ice water to drink later. 9) It's okay to take a break. Let's be honest: tickets to get into Disney theme parks are not inexpensive. While it's tempting to try and stay from open to close in order to get every penny's worth of fun out of your ticket price, being in a theme park for 10 or more hours can be really draining. If you stay all day, you might end up not having fun if you're hot and cranky at the end of the day. This is doubly important if you're traveling with kiddos. Wake up early to get to the park at opening time but plan to take a break mid-day. Head back to your hotel if it's not too far away and take a nap. Come back a few hours later when it's begun to cool off to finish the day. This of course, assumes you brought a stroller - which I highly reccomend even if you don't normally use one. Our son frequently goes on 3-4 mile hikes - he's a hearty kid with a fair amount of endurance - but I'm so glad we dug out his old baby stroller to bring with us. They don't have to ride in it the whole time but they're great for helping tote your things, holding drinks and are a life saver if you're on the far side of the park and your kid decides they are too tired or too cranky to go on. If you bring your stroller, be sure to bring your rain cover too. Don' t have a rain cover? You can fashion one from a dollar store poncho or even a large garbage sack. You will need to leave your stroller in designated stroller parking areas to get on many of the rides or go into the shows. If you'll be leaving your stroller for more than about 10 minutes (like for a show or a long ride) or if the sky looks like it might even be thinking about rain, be sure to cover your stroller before you park it. The weather can change pretty quickly and it's no fun to leave a show and come back to a drenched stroller. Have you been to Animal Kingdom? If you have your own tips for making the most of your visit please leave them in the comments! Thanks for the tips, Carissa! We hope to visit Disney World someday! Love all of these tips! I love Animal Kingdom and plan on visiting next month! I will use these tips next month when we go. We love to visit Disney; these are great tips & reminders for any of the parks. Thanks for sharing! We splurged on dinner at the jungle-themed restaurant on the way out. Worth it for the entertainment value despite less than great food quality. I like the idea of dressing up!